Martha Stewart Crafts Graveyard Edge Punch Tombstones Raven Halloween Border. Condition is Used. Shipped with USPS First Class Package. Paper Punch LOT ~ Martha Stewart Crafts lightly used border punch and around the page set, Fiskars New apron lace border punch and New leave it to weaver border punch, EK Success New edger punch. Shipped with USPS Priority Mail. Martha stewart punch lot. Condition is Used. Shipped with USPS Priority Mail.Some of these punches have been used and some haven't. Only three are not Martha's punches. All sales are final. Punches worked fime to me. I have tooany and jot using it. Needs agood home to create with. ADD 10 CENTS FOR EACH ITEM AFTER THE 1ST ONE. 15 bunny borders Cut With Martha Stewart Punch. Martha Stewart Crafts. Use this punch on the edge of the page. Use for card making, scrap booking and other paper crafts. Creates a continuous die-cut edge along both sides to make a decorative strip. Add this craft knife from Martha Stewart to your kit for various DIY projects. It has a soft grip and a beveled tip to ensure comfort, precision, and a steady cut. You can use this knife to crop, cut or shape various craft materials. Hydrangea Pop Up. Martha Stewart Crafts. Punch = 1.75" x 4.75" x 3". Gently Used. Punches paper with ease. Has typical scratches and scuffs from use. Martha Stewart Crafts. Use alone or combine both for all around effect. Use corner punch first, then use border punch to connect the pattern from corner to corner using guides printed on the tool's wings. New MARTHA STEWART Crafts Spray Paint Kit Sealed. Free Shipping! New MARTHA STEWART Crafts Spray Paint Kit Sealed. Free Shipping!. Condition is new. The item for sale is a Martha Stewart Crafts Snow Flurry Punch Around the Page Corner Punch. NOTCHED SQUARE Martha Stewart Edge Craft Punch 42-40107 with folding wings NEW! By Martha Stewart / EK Success. NOTCHED SQUARE. Wings fold in for convenient storage. Creates a continuous die-cut border design. Use for card making, scrapbooking, and other paper crafts. Martha Stewart Crafts. Layering 2 in 1 Craft Paper Punch. Garden Butterfly. Punch = 3" x 5.75" x 3". Gently Used. Punches paper with ease. Has typical scratches and scuffs from use. Box never opened. See photos. Includes 75 pieces. Label size 2.5in x 8in. New/unused in opened box. A fantastic addition to your crafting collection! Trending at $7.74eBay determines this price through a machine learned model of the product's sale prices within the last 90 days. Lord Computer - Martha Stewart Crafts Doily Lace Cupcake Stand. Build a tempting centerpiece with this Doily Lace cupcake stand from Martha Stewart Crafts. Three tiers with delicate paper trim assemble easily. Martha Stewart Punch Around the Page. Flower Shower. Martha Stewart Punch around the Page ~EYELET LACE. Includes border punch with matching corner punch. Samples shown are just a few. .
Trending at $27.00eBay determines this price through a machine learned model of the product's sale prices within the last 90 days. Martha Stewart paper punch - You Choose! MARTHA STEWART. But the punch has never been used and is new! HALLOWEEN SPIDER WEB . LARGE DOUBLE PUNCH. This fabulous punch from Martha Stewart produces crisp shapes for cards scrapbook pages and other paper crafts. Imported-Made in Taipei, Taiwan. Use this punch on any area of the page and create multiple Dove punch-outs. 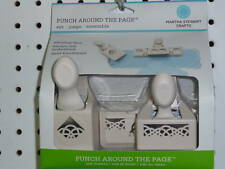 Martha Stewart Punch around the Page ~DOUBLE LOOP PUNCH SET. Includesborder punch with matching corner punch. Martha Stewart Double Craft Punch - LADYBUG. DISCONTINUED - HARD TO FIND. Sooooo cute and great for so many occasions.. Valentine's is just ONE idea but it's great for. Trending at $21.65eBay determines this price through a machine learned model of the product's sale prices within the last 90 days. Martha Stewart SCALLOPED FLOWER Stamp and Punch. out flowers. MARTHA STEWART. Includes a Corner Punch and Edge Punch. HALLOWEEN SPIDER WEB . Punch Around the Page Set. Martha Stewart PEPPERMINT Double Craft Punch Christmas Embossed Punch New Brand New in sealed package Creates perfectly shaped cut-outs Use for card making, scrapbooking, and other paper crafts. FESTIVE WREATH. MARTHA STEWART. Super Duper RARE! NEW, IN SEALED BOX. Make beautiful cards, invites, photo borders or other paper craft projects with these lace punches from Martha Stewart Crafts. This set features an edge punch and a corner punch to create a continuous design. You can also use separately to personalize your projects! The edge punch has foldable wings for easy storage and measures 1-3/4” x 1/2”. The corner punch measures 1-1/10”x 2/3”. Item comes from a smoke free and pet free home. Thanks for looking!